A cute and colorful book about everyone's favorite jolly old elf. It probably isn't going to be a classic, but it's fun and helps get kids in the holiday spirit. 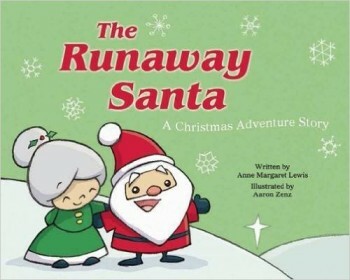 “There once was a jolly Santa who wanted to run away from the North Pole on an adventure.” And so begins the Runaway Santa, a silly tale about Santa sneaking off to have a little fun and a big adventure. Santa just wants to get away for a while, even if he does have a lot on his plate just now. But before he can take off for parts unknown, Mrs. Claus has a few suggestions for him. Mrs. Claus loves her jolly Santa, so she wants to make sure he’ll be safe wherever he goes. And so she asks Santa to tell her where he’s going. As Santa envisions a variety of exotic locations, from historic Mount Rushmore to an exciting African adventure, Mrs. Claus offers to pack whatever he’ll need to have a great time, whether that’s rock climbing gear, speedy skis, or a festive new suit. As Santa names off each of his imagined adventures, kids are treated to a full page spread of Santa on the adventure, and Mrs. Claus sneakily hiding nearby to make sure he’s safe. The book ends on a happy note, as jolly Santa suggests that Mrs. Claus come along for a fun adventure together. 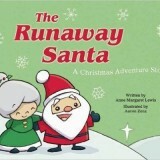 The Runaway Santa is a fun little holiday book that will gets kids in the Christmas spirit as the holidays draw near. There are colorful illustrations of Santa on all sorts of adventures, and each page only has a sentence or two, making it ideal for beginning readers to tackle. Though the story isn’t ground breaking, kids will love seeing the big guy in a whole new way. The book itself is of sturdy hardcover, with a removable slipcover that probably won’t last long with young kids in the household (although the cover images are printed right onto the book as well, so the slipcover really isn’t necessary). Though the repetition and minimalistic style likely won’t hold your older kids’ attention, The Runaway Santa is a great choice for the young Santa fans in your household.